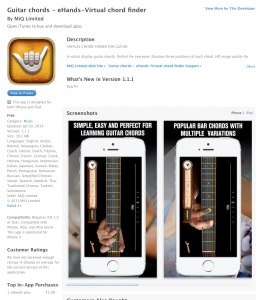 A virtual display guitar chords. Perfect for everyone. Displays three positions of each chord. HD image quality for popular chords. Also Displays three variations of popular Major scales and minor scales. Tap Guitar to see variations. Tap play button to hear sound. Beginners will love this app. So simple.. No more confusion while learning chords. If you wanna join our VIP and grab free gear and apps goto: getjamn.com/vip to signup. We built it because we love to have an awesome metronome to practice in time. The metronome is simple, beautiful and powerful. Beats Metronome can be set to a whopping 35 different time signatures, including compound and complex meters. It also sports a handy tap-tempo function—great for figuring out song tempos—and 17 different tone options. Turning on Flash Mode in the Settings page enables a strobe-like flash on each beat (it can also be set to flash only on the downbeat). This mode can be very useful onstage or in other low-light environments. A different type of graphic depiction of the beat is provided when the Visual Beats function is turned on and the iOS device is rotated to landscape mode. The display changes to show circles that represent the beats in a measure. As the metronome counts the time, the appropriate circle is highlighted, providing an easy-to-follow visualized version of the tempo. Developed by Positive Grid, the leading developer of music software tools. We focus on things that are solid for working musicians, with simple interface and cutting edge algorithm. 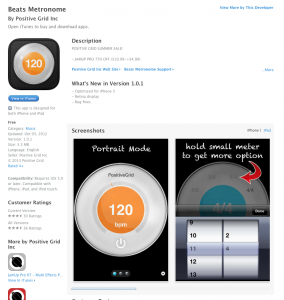 – Portait mode: it's a fully featured and configurable metronome. – Landscape mode: becomes a simple and beautiful visual beats machine. – Advanced subdivisions including Triplet, Dot Note and many other patterns. – 17 different sound sets including classic Seiko SQ50, Cool Edit, Kristal, Cow Bells, drum, stick, rim, tambourine, bell, click, ding, effect and many more. – Universal app, ready for iPad, iPhone and iPod touch. 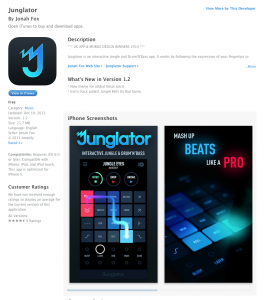 Junglator is an interactive Jungle and Drum'N'Bass app. It works by following the expression of your fingertips to create flowing beats and rhythms. Auto-sync gives complete control and keeps everything in time allowing you to create fun and intricate mashups. You can combine multiple effects, from pitch control, filter sweeps, SFX and more to twist up the sound. Cue buildups, drops and breakdowns to create your own performance and control the music in a unique and exciting way. Rinse out your jams to the next level and create seamless mixes: the tracks are automatically kept in time, allowing you to concentrate on creating the perfect performance. Junglator will give you a DJ experience like no other. Now with support for AudioBus as a source.